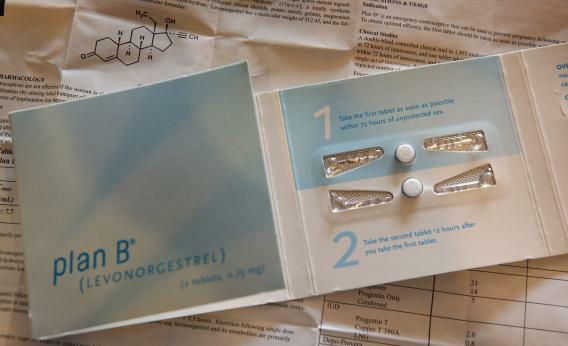 Plan B emergency contraception rules soften for adults but not for teens. Plan B will no longer be kept behind a pharmacy counter, but you’ll still have to show ID to buy it. Late on Tuesday, the Food and Drug Administration announced a new development in the long, arduous journey to make Plan B easier to access for women of all ages. The agency has approved a request, made by Plan B’s manufacturer, Teva, to drop the age restriction on the drug to 15. The drug will be put on pharmacy shelves—it’s currently held behind the pharmacy counters—but customers will still have to show ID to prove they’re 15 or older when they buy it. The choice of the FDA to make this decision now is slightly unusual, because the Obama administration is still reviewing a federal court ruling from earlier in April demanding that Kathleen Sebelius, the health and human services secretary, rescind all age restrictions on the drug. The judge gave the administration 30 days to comply, and time’s running out. This new FDA ruling puts even more pressure on the Department of Justice to stop fighting the courts. If they appeal now, they’re going to look like fools who don’t know how to pick their battles. In the meantime, while this new rule is definitely an improvement over the old one, it still has major drawbacks. It’s good that customers don’t have to go to the pharmacy counter to ask for Plan B anymore. Being able to pick it up and check out with it reduces the chance of embarrassment and long waits at the pharmacy. Putting the pills on a shelf with the condoms also makes it clearer that men are allowed to buy Plan B. Still, lowering the age may not do much to improve access for teenagers. After all, how many 15-year-olds have the government-issued ID necessary to prove their age to the cashier? Even 16- and 17-year-olds may run across this problem, as fewer of them are getting driver’s licenses, often the only kind of government ID teenagers have. Because easy access at drug stores still cannot be assured, it’s probably best to stick with the American Academy of Pediatrics recommendation: A dose of Plan B should be kept on hand in homes with teenage girls, even if they’re not currently sexually active.